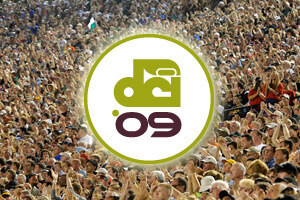 These fans attended the DCI Dallas event at the Wildcat-Ram Stadium on July 16 and 17. 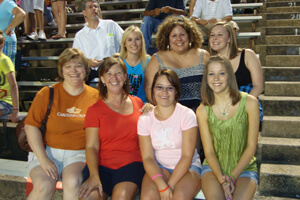 This 2009 summer tour marks the 30th year Elizabeth Clark (center in red) has been attending drum corps shows at Lake Highlands High School in Dallas. Her daughter, a high school senior named Shannon Clark (center in pink) marched as a member of the '09 Boston Crusaders until a week before the Dallas show when an injury sidelined the guard member for the rest of this season. The Clarks came out to cheer for the Boston, as well as other corps where their friends march and teach. Coming out with a group of more than 60 color guard and drum line students from Flower Mound High School was a great way for the Clarks to catch up with friends and enjoy an evening of incredible performances. "It's friendly, and it's exciting," Elizabeth said. 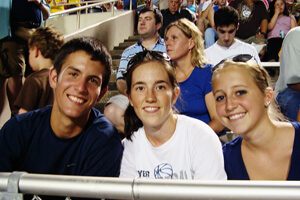 As for Shannon, even though she misses her friends with the Crusaders, she was excited about seeing the corps perform. "She'll be back next year," her mom said. Gill Barnett (left) came to Dallas to see her son perform with the Crossmen, where he plays with the drum line. Tagging along for the three-and-a-half hour haul from Edmond, Okla. was Abbey, an Irish setter in training to be a service dog. 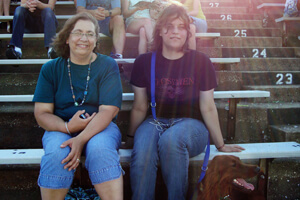 "She goes everywhere with us," daughter Sarah (right) explained. The Barnetts volunteer with an organization called A New Leash on Life to prepare dogs for jobs helping the elderly and disabled. The experience was good for Abbey because of the training it will provide her after dealing with the distractions of the big crowd in the stands and the corps on the field, plus Gill and Sarah got to spend some quality time with Abbey. 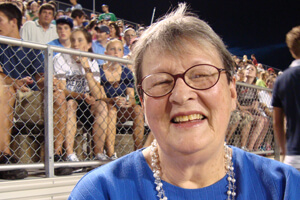 Doris Bellington came to Dallas to see her grandson, Blue Devils drum major Andrew Rogers perform. She said that the thing she loves most about drum corps is the attention to detail and meticulous planning that goes into each corps' production. Having been involved with music for her entire life, Doris, 79, has been a musician, teacher and music fan with choirs and bands for years. "No matter who you are," she said. "People love and respond to music." Will Steward, Taylor Willard and Rebecca Tennyson came to the drum corps show in Dallas from Denton, Texas to "hype" the drum line at Guyer High School for the upcoming fall marching band season. The fans said they were fans of the Cavaliers' drum line, but also like Phantom Regiment. Will said he likes the Cavaliers because of how much fun it is to watch the drum line's performances.